Where was the Internet when I was doing this in stores and getting in trouble for it? I could have made some cash doing this! Dear employees, JOIN IN with this kid! He's awesome! This is making me laugh today :) I don't know what I'd do without MST3K! Me: "Basically, I've stripped the operating system off of this and put a new one on." Gretchen: "I showed my brother-in-law how to right-click this weekend. He was so impressed." Me: "You only knew how to do that because I showed you." Gretchen: "I was always wondering. I found a way around it for years." This is true talent at SUCH a young age. I want to scoop this little one up and take her somewhere where she never has to feel the feelings she's singing about. 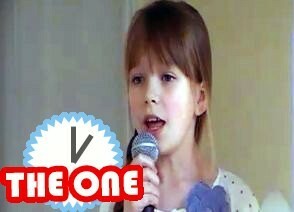 Connie Talbot wowed viewers of Britain's Got Talent with her voice when she was just 6. Now she's a hardened industry veteran (at the ripe old age of 10), and she's posting up some amazing cover songs to YouTube. Her latest video, a fantastic rendition of Adele's "Someone Like You," shows off a voice that sounds like it's coming from someone twice her age. She's totally sandbagging in the YouTube video description, too, all, "Oh yeah this is okay I guess, but I still need to practise (you know practice with an s because I am British and such)." Little girl, you are 10, and most grownups couldn't sing like you with all the practise in the world. I know it's tough trying to stay one step ahead of Heather Russell, but sometimes it's okay to just take a break and organize your collection of Justin Bieber Neopets or whatever. We won't tell. I realize it's wrong and ridiculous, but I love this app so much.